Pests can easily get into your shed without you even knowing it – not until an *infestation* happens, and there is nothing worse than that! Not only can some pests destroy or ruin your belongings they can also have a negative impact on your health. Termites are always moving around, and they can now be found in places they were never seen before. The damage termites cause is costly, and termites can even infest homes built from brick or stone. Insects like cockroaches can still carry with them a range of illnesses, including salmonella and gastroenteritis – which is particularly dangerous for children and the elderly. 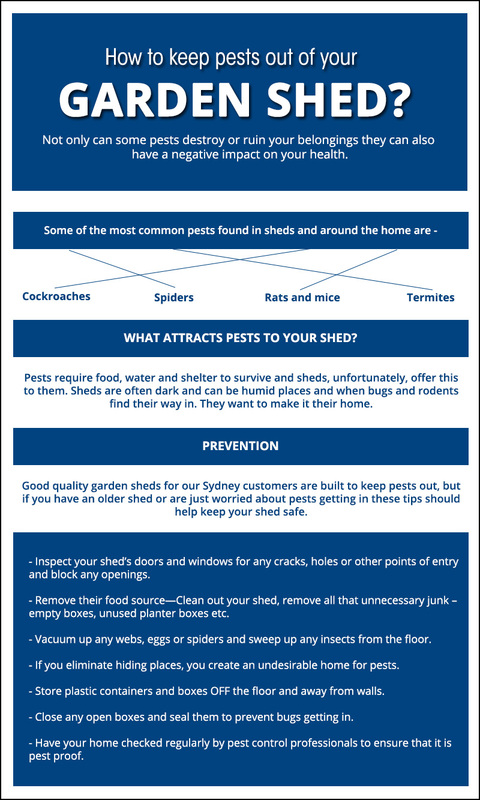 What attracts pests to your shed? Pests require food, water and shelter to survive and sheds, unfortunately, offer this to them. Sheds are often dark and can be humid places and when bugs and rodents find their way IN they want to make it their home. This can attract other pests to your shed – as your shed now contains its food supply. Good quality garden sheds for our Sydney customers are built to keep pests out, but if you have an older shed or are just worried about pests getting in these tips should help keep your shed safe. Inspect your shed’s doors and windows for any cracks, holes or other points of entry and block any openings. throw out any untreated or unused timber which is perfect for termites. Remove any garbage from your bin and any animal or bug droppings you find. Clean out your shed, remove all that unnecessary junk – empty boxes, unused planter boxes etc. Vacuum up any webs, eggs or spiders and sweep up any insects from the floor. If you eliminate hiding places, you create an undesirable home for pests, Store plastic containers and boxes OFF the floor and away from walls. Close any open boxes and seal them to prevent bugs getting in. Have your home checked regularly by pests control professionals to ensure that it is pest proof, after all, if you find you have pests in your shed, it’s likely that, unfortunately – you have them in your home too. Don’t place your garden shed right next to a wall – especially of your house – this way you can check your home for openings or pest infestations without having to move the shed away from the wall.